Post #400? Already? Wow. Instead of writing a whole new sentimental post, I'm going to invite you to travel back in time to Post #300. It's still my favorite post of all time, and it still completely expresses how I feel about this whole blogging thing. Now on to more practical matters! You might recall that a few months ago, I received a generous gift of a giant box of cookbooks from a relative who had no need for them. A few of them were duplicates of books that were already on my shelf, so I decided to share them with you. First I gave away The Joy of Cooking, and made an awesome new blog friend in the winner. Hi Grace! This week's giveaway is for the classic Silver Palate Cookbook. This particular version is a first edition and is about the same age as I am, but it's like new. The pages are crisp and it may never even have been opened before I flipped through to check its condition. I can't wait to pass this along to one of you! To enter: Leave a comment on this post by noon Pacific Time on Monday, March 1st. You can say anything, tell me who you are, where you're from, what you like to cook, how you found Playing House, share your favorite recipe, or just say hi! I'll choose the winner Monday afternoon using a random number generator. Love the Silver Palate Cookbook! Found you via @travelingbaker. I love to discover new (and old) recipes! Are you sure you want to give it away? I would LOVE it and give it a good home. Sheila Lukins is amazing. I have her "USA Cookbook" and always intend to buy more--the recipes are amazing. My mom has this cookbook and it's one of her favorites :) This would be an awesome thing to win! Your blog is great Amy! I found your blog a long time ago from weddingbee - I actually was the person who bought your veil from you! It's been great catching up with you and your food adventures! Happy cooking! 400 posts is epic! New cookbooks are like crack to me, I could sit and read cookbooks all day long. I'm very jealous of your generous cookbook donating relative. Thanks for sharing the goodies with us! Hi Amy, Katie here in Olympia WA. I don't remember where or how I found you, but I believe Wives with Knives! Amy, you know you rock. I think this is so sweet =D. Lets see... I'm Lauren, from Canada, who likes to cook gluten-free goodies, and found Playing House through the Daring Bakers, and one of my favourite recipes are the Pumpkin Chocolate Swirl Cheesecake Bars I adapted from you, and Hello =D. Congrats on 400! I found you through Carolyn's cake site on FB and am enjoying reading about your cooking journey as I recently started one of my own. I'm also taking Carolyn's #1 class and loving it! Hope class #2 is great fun because I plan to continue. Hope you post something about your experience in class #2. I stumbled upon your blog, and I just love reading it! I can't wait to try some of your recipes! I thought I had already commented, but I guess I hadn't. Quintuple chocolate brownies made an excellent lunch today! Thank you. And congratulations on #400! My sister bought this book a while ago. I was looking through hers and loved it. She would not give up her volume. I think I found your blog through the Daring Bakers, I live north of you in the Corvallis area, and I just love your blog and the fact that you post just about every single day! :) Also, I don't have this book and I'm crossing my fingers that I win it! I've never heard of that cookbook before, but I'm sure I'd love it. I actually can't remember how I found your blog, but I got hooked as a fellow PNW'er and cook (well wannabe for me!). I'm hooked on Crock-potting and use a lot of Stephanie O'Dea's recipes. Congrats on the 400th post! I love your blog...I love you. When we move, I'll be comforted by the fact that I can keep up with you on your daily cooking adventures and thoughts. We have a potluck at work tomorrow; I wish we still worked together so I could eat YOUR FOOD!! 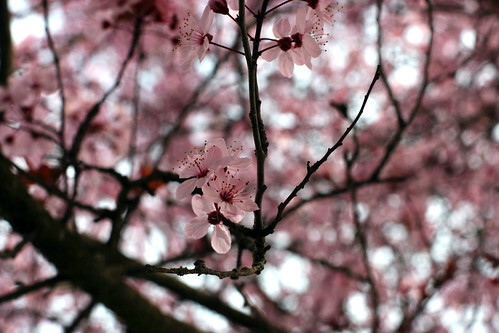 I loved your cherry blossom picture! Those are cherry blossoms, right? Either way, I saved it as my new desktop wallpaper. I'm a good friend of Elana Hertel's and I LOVE your blog! Keep up the cookin' lady! Holy crap! That 100 recipes flew by so fast! I remember #300. You are still quite the inspiration miss Amy! Love ya! 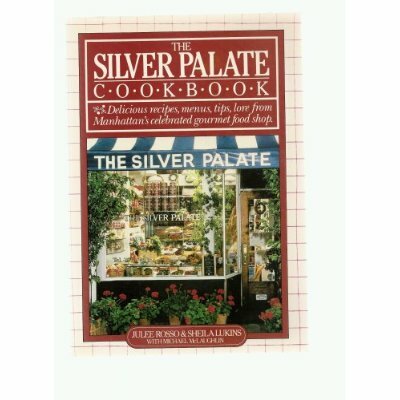 Ah, I've never owned The Silver Palate, and when Sheila Lukins died I heard so much about it. (The NPR piece after her death was especially poignant.) I just reread Post #300, and it still sums up for ME exactly why I love visiting Playing House. Keep it up, Amy - you do beautiful things over here! Hi! I love your blog.. what brought me to it was the oreo cheesecake cupcakes...yum!!! Hi! I found your blog when I was searching for nanaimo bars a while ago. I've tried some of your recipes and they have been delicious! Congrats on 400 posts! Congrats on 400! The book looks good! hi amy! this is sO awesome! congrats on your 400th post! my name's nina =) and i'm from south africa. i found you on twitter! that cookbook looks amazing! i love cooking a ton of different stuff, but anything with good, simple fresh ingredients is awesome - and i also tend to lean towards more vegetarian dishes.. i love your blog! ohhh that cookbook sounds fantastic! I think I might have found you first on EAL but I'm not sure, I feel like there were a couple of different places... Regardless I always love reading and trying the recipes! And 400 posts, that is incredibly impressive! Your posts are very fun. I can't remember how I found you though. Should I confess that I am not familiar with the Silver Palate cookbook? Perhaps that's even more of a reason why I should win the giveaway :) I read food blogs while I should be writing my thesis on diversity programs. Sad. You have a lovely blog and I enjoy it! i love your posts and am excited to make some of your recipes. I'm not sure where I found your blog, someone else's link I'm sure. BTW, it's not noon here in CO, yet. Does that still count? It's only 11 AM!